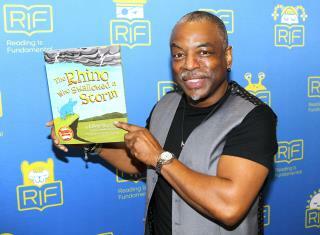 (Newser) – Those who grew up with Reading Rainbow will likely be dismayed to learn that there's a big fight between the owners of the show and the celebrity with whom it's most closely associated—LeVar Burton. Burton hosted the show on PBS from 1983 to 2006, and starting in 2009, Burton started discussing plans to revive the show in some fashion, the International Business Times reports. In 2011, Burton's company, RRKidz, got a license from New York-based PBS affiliate WNED (which describes itself in its lawsuit as the show's co-creator and exclusive holder of rights to the series' logo and associated intellectual property) to use intellectual property related to the show, but WNED is now suing Burton and RRKidz—for the second time, according to the Hollywood Reporter. WNED says Burton and RRKidz are trying to "control and reap the benefits of Reading Rainbow’s substantial goodwill" without having the right to do so. Wow, he has aged. Hardly recognize him, after only about 10 years since I saw him on PBS show. I guess he chose to work in that area, but ain't a lot of money in it anyway. Leave the man alone! He's doing something that makes the world a better place. That doesn't deserve lawsuits and harassment... i hope he uses a phaser on them! I think the problem started when Burton wanted to use the stage name Kunta Kinte, but the producers preferred Toby.